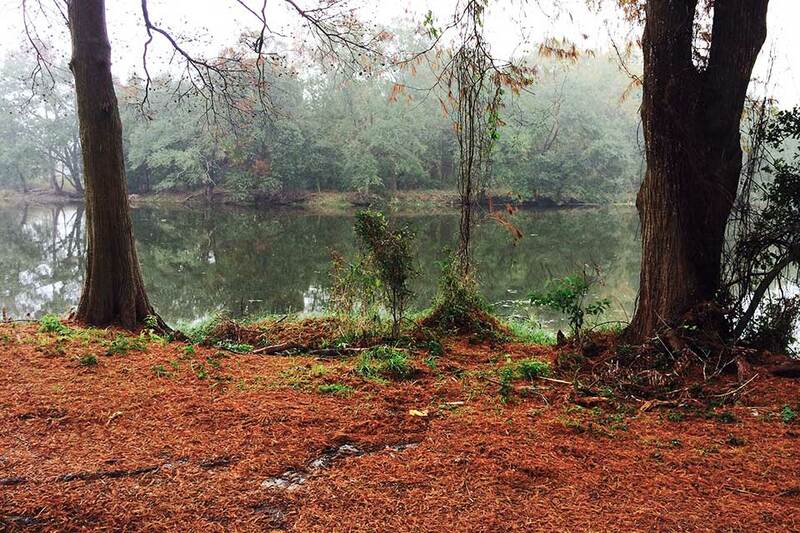 With some foresight and minimal effort, the entirety of Scout Island could be made a publicly accessible natural area, which could easily be combined with the adjacent Couterie Forest to the north. The result would be a new whole that is greater than the sum of its parts—a freely accessible ‘in-nature’ experience in the heart of City Park. 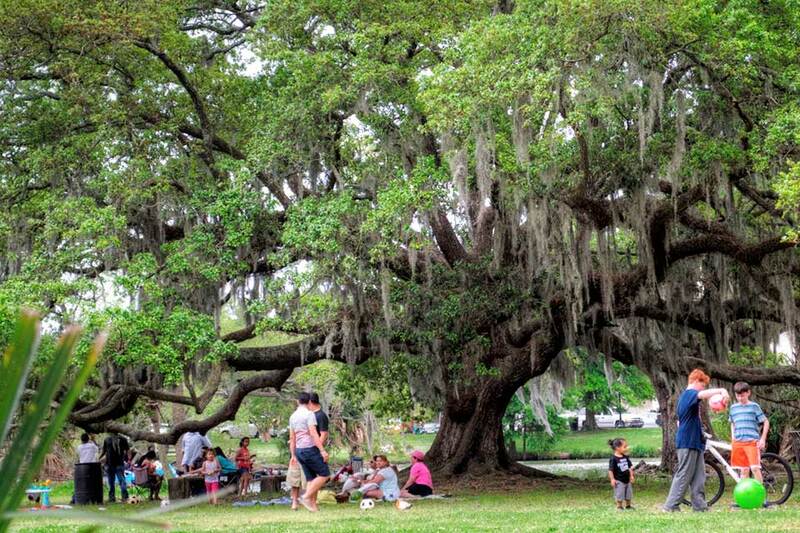 New Orleans’ parks are chronically underfunded. 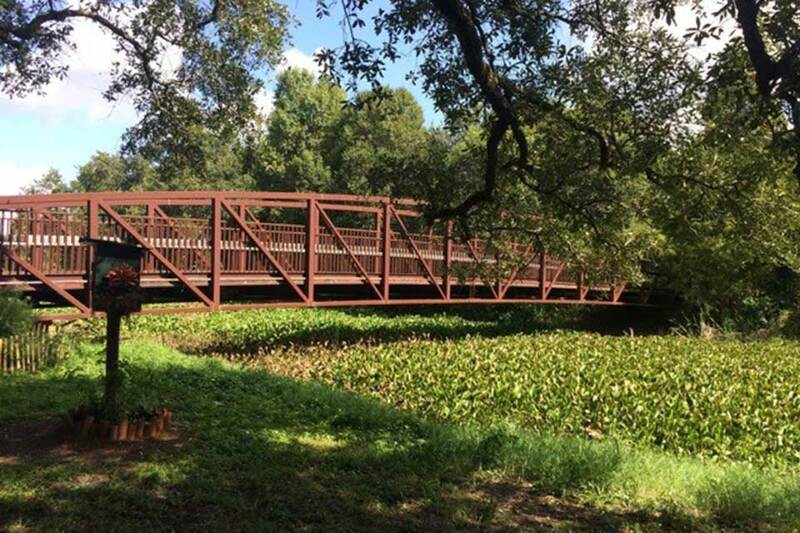 In need of money to provide maintenance and services, the park managers of Audubon Park and City Park, the city’s two premier parks (which are managed independently of the city’s parks agencies), have turned to monetizing the public open spaces within the parks they oversee. In some cases, existing fee-based programming within parks is expanding, creating a paywall for public use and devouring the green space reserved for free passive enjoyment. In other cases, new large-scale construction projects are being introduced to generate revenues via steep entry fees and annual rents. This inequitable use of public resources stems, in large part, from the fact that responsibility for the city’s parks is distributed among eight organizations and agencies (city, state, and federal). The result is a fragmented, ill-defined vision of how best to manage open spaces in the public’s interest. And because many types of facilities and activities—from golf courses to restaurants and playing fields—are currently classified in zoning documents as “permitted uses” of parks, there is effectively no meaningful public participation or city oversight in the decision-making process. From its founding at a bend in the Mississippi River in 1718, the French settlement of Nouvelle-Orléans grew around a series of public landscapes. Jackson Square (originally the Place d’Armes), Congo Square, Washington Square, and, by the nineteenth century, Lafayette Square, Washington Square, and Coliseum Square served as the hubs of civic and social life in an expanding patchwork of neighborhoods spreading upriver from the Vieux Carré (known today as the French Quarter). 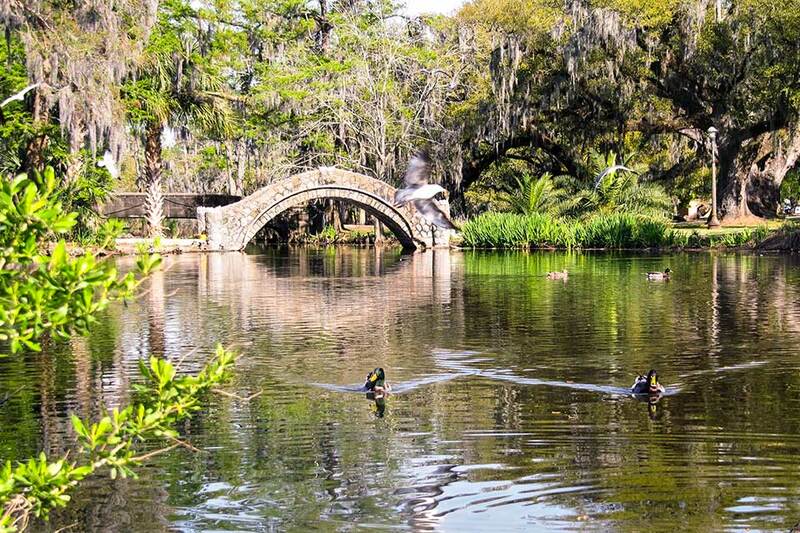 By the end of nineteenth century, the city had begun to develop two large urban public parks, City Park and Audubon Park, which flourished under the influence of the City Beautiful movement. 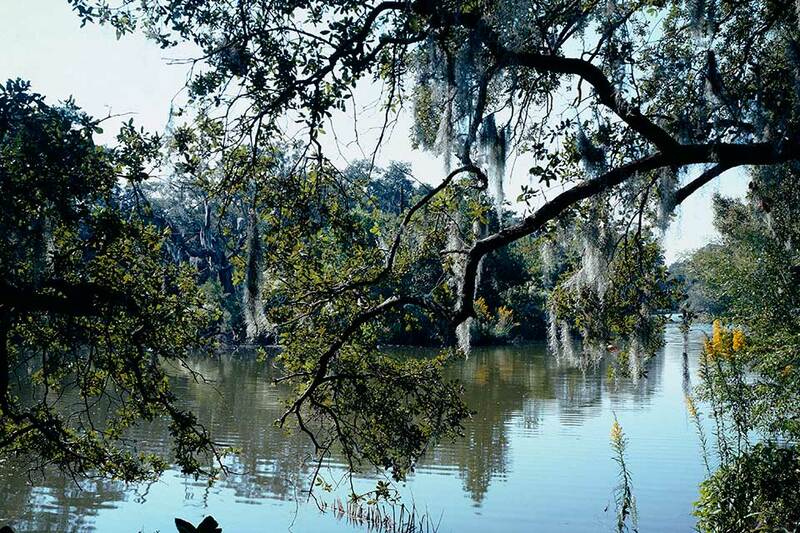 Once the site of a sugar plantation, the land that became Audubon Park was purchased by the city in 1871. A large Victorian-style conservatory (based on Joseph Paxton’s Crystal Palace in London), gardenesque flower beds, and allées of live oaks were added to the southwestern section of the park when it hosted the World’s Industrial and Cotton Centennial Exposition of 1884. These elements were retained when John Charles Olmsted, of Olmsted Brothers, was hired in 1898 to transform the swampy, divided flatland into a park. 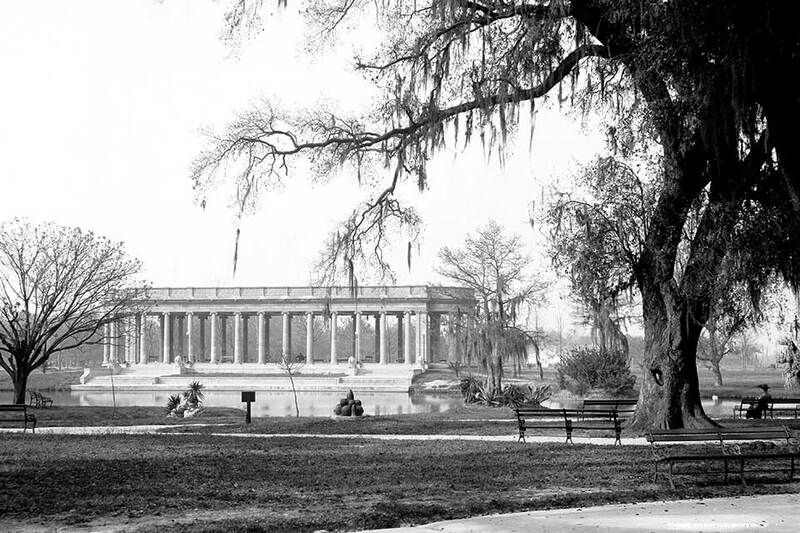 His design, in 1902, unified the site and solved drainage problems by developing a varied watercourse, later called the lagoon, which meandered through the two major sections of the park (north and south of Magazine Street). On the northern half of the park, he used fill from the resulting lagoon to grade the flat site into a rolling meadow, which quickly became an eighteen-hole golf course. While the park’s current 340-acre configuration follows much of the Olmsted plan, the planting recommendations and the full watercourse were never implemented. In the early twentieth century, a zoo was established in the southern portion of the park. The zoo developed more fully during the 1930s and was completely overhauled in the mid-1970s. It has since seen several major changes to its master plan. The original golf course was also reconfigured (into an ‘executive course’), effectively removing passive open space from public access. The park includes a 1.8-mile-long pedestrian path around its perimeter, riding stables, and Ochsner Island, a prime birding spot. In 1854 philanthropist John McDonough donated the land for City Park, which was originally part of the Allard Plantation. The park remained overgrown until 1891, when Victor J. Anseman formed the City Park Improvement Association, which developed the park and continues to manage it today. Significant projects from this era include the New Orleans Museum of Art, opened in 1911; the Carousel Gardens Amusement Park, listed in the National Register of Historic Places; the Peristyle, Popp Bandstand, and Casino Building, all built between 1906 and 1917; and the golf course, expanded from nine holes to 27 by golf professional George Turpie in 1922. In 1933 Bennett, Parsons & Frost, of Chicago, completed a master plan for the park. 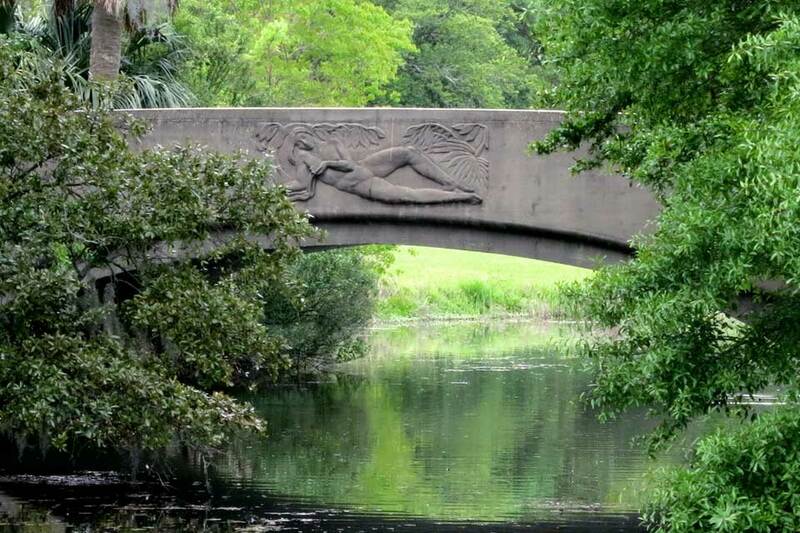 Implemented by the Works Progress Administration, the plan included stone bridges and roads; Tad Gormley Stadium; the New Orleans Botanical Garden; an expansion of the golf course; and a planted section known as the Couterie Forest. Covering 1,300 acres, City Park is among the largest urban parks in the United States, dwarfing, for example, New York City’s famed Central Park (843 acres). 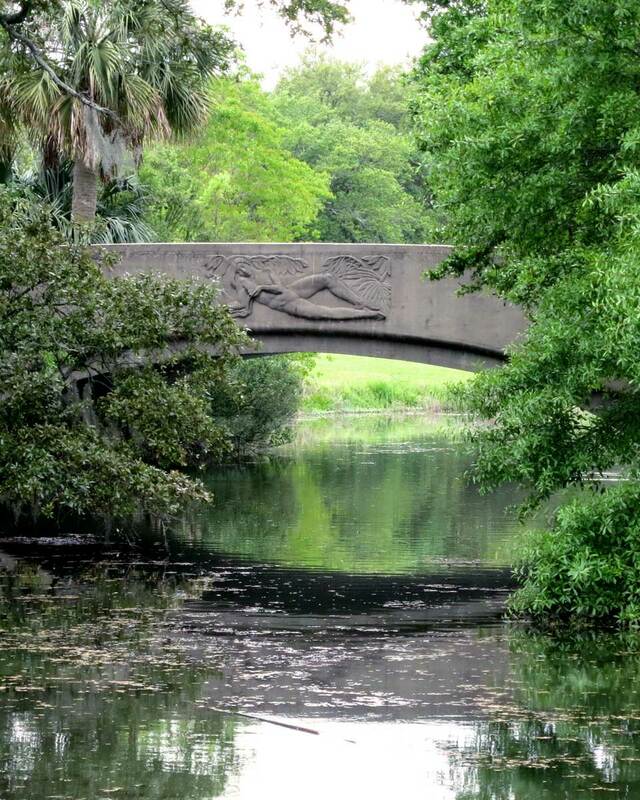 Audubon Park is one of ten public entities (including Audubon Park Golf Course, the Audubon Zoo, and the Aquarium of the Americas) currently controlled by the Audubon Commission, a 24-member City board appointed by the mayor. 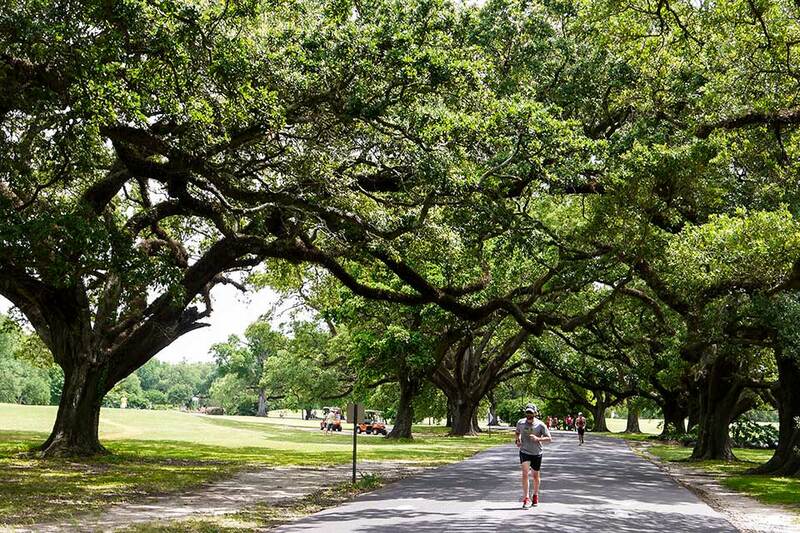 In 2002, the Audubon Commission introduced a plan to expand the Audubon Park Golf Course within Audubon Park and to construct a restaurant, amid a large oak grove, in the northern portion of the park. Despite a lawsuit, vocal opposition, and claims that the plans had been pushed through without sufficient public notice, the restaurant, along with the paved roads and the parking lot that accompanied it, was built, demolishing the Heymann Memorial Conservatory in the process. In 2014, a new millage was placed on voters’ ballots, intended to support the zoo, the aquarium, and other facilities controlled by the Audubon Commission for years to come. Voters denied the measure by a nearly two-to-one margin, the first time a zoo-related issue had been defeated in the city. The opponents, mounting a grassroots effort with a minimal budget and the use of social media, argued that because the city’s neighborhood parks and public open spaces are underfunded, additional tax revenues to support facilities accessible only through prohibitive entry fees (zoo admission for a family of four costs approximately $80) would be bad public policy, the more so because Audubon Park is the only public park in New Orleans that already has a dedicated tax-based revenue stream. 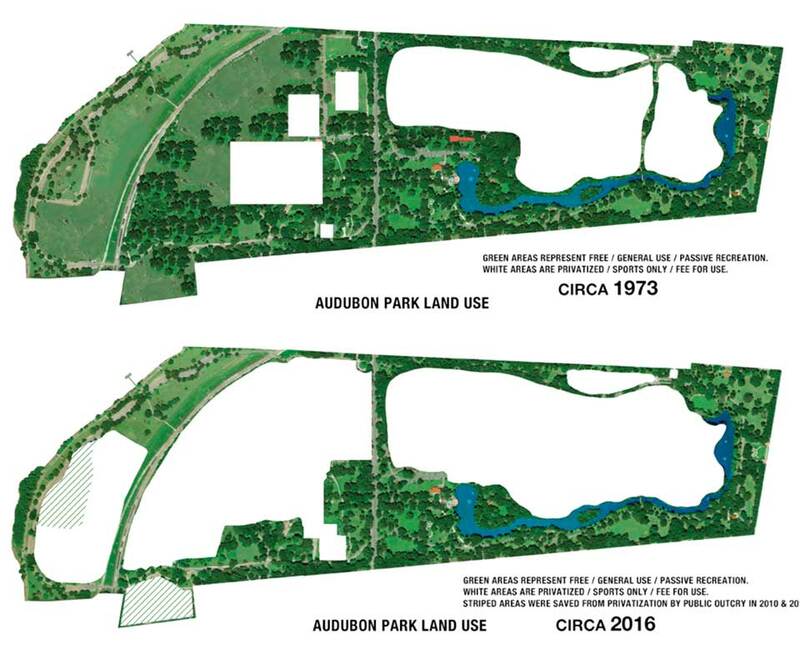 In the wake of the failed ballot initiative, public discussion about access to open space continued when, in 2015, the Audubon Commission voted to convert acreage in the area known as The Fly, the portion of Audubon Park that fronts the Mississippi River, to an artificial-turf soccer complex accessible only to members of a privately managed athletic organization. After weeks of public dissent and the revelation of a blatant conflict of interest regarding an Audubon Commission board member, the soccer complex was cancelled. Even so, a map of Audubon Park clearly illustrates how much freely accessible green space the park has lost in little more than 35 years. Today, such green space accounts for less than one-third of the park’s area. 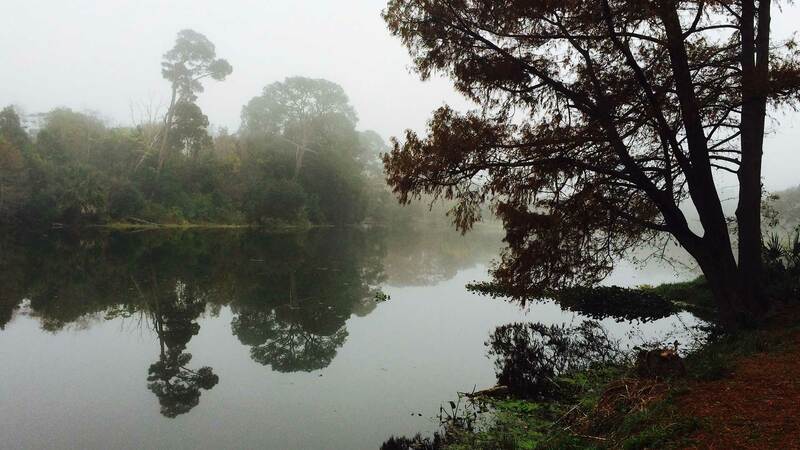 Unlike Audubon Park, City Park is not supported by a millage. While the park receives minimal funding from a state tax on slot machines at the nearby Fair Grounds, upwards of 90% of its annual budget comes from renting portions of the park and from tennis, golf, and soccer fees. The City Park Improvement Association, a state agency with its own board of directors, manages City Park. Like Audubon Park, City Park is thus not subject to any significant oversight from the City of New Orleans. In April 2017, Bayou Oaks, a “full-service golf complex” comprising a 36-hole golf course with a driving range, practice area, and clubhouse with dining facilities, opened in the park. 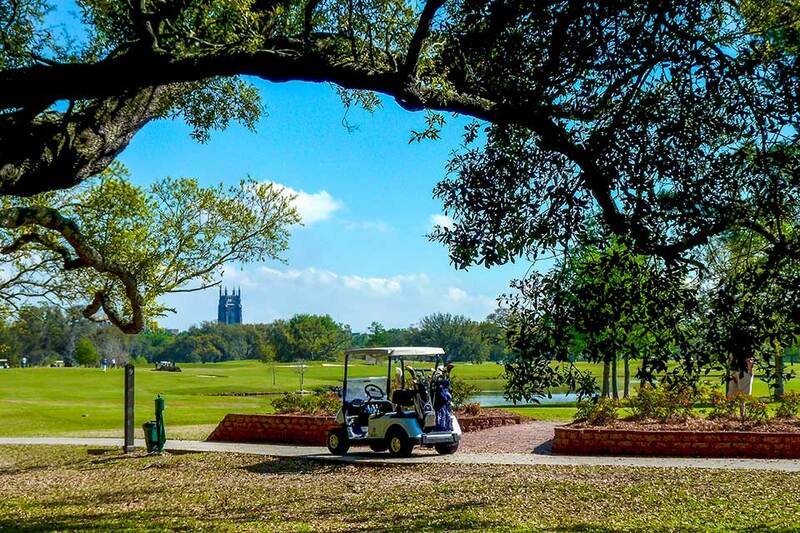 City Park CEO Bob Becker said that the golf course was “vital to the park’s bottom line” (an annual four-day pass to Bayou Oaks costs $2,000; an annual seven-day pass costs $3,000). 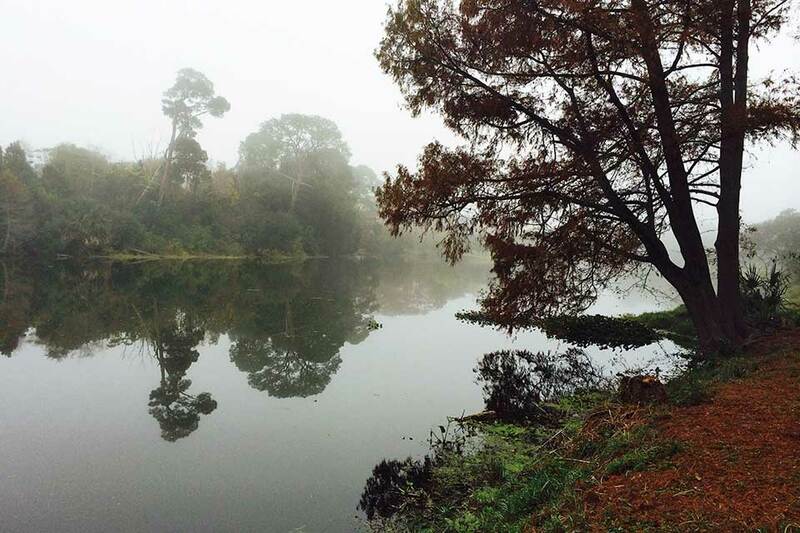 Formed in 2015, the City Park for Everyone Coalition filed a lawsuit accusing City Park of failing to disclose in its 2011 master plan that 5.5 acres of Couterie Forest, an enclave of trails, natural vistas, and native trees comprising eight distinct ecosystems, would be cleared to build the golf course, which was otherwise planned to replace a golf course ravaged by Hurricane Katrina. A federal judge dismissed the lawsuit in November 2015. Yet another new building project is slated to open in the southern section of City Park in early 2019. The new Louisiana Children’s Museum will replace its predecessor on Julia Street in downtown New Orleans. The new museum complex will occupy 8.5 acres of parkland overlooking a lagoon and will include five exhibit galleries, a literacy center, a teaching-resource center, a café, an edible garden, and a sensory garden. While the groundbreaking ceremony took place on May 20, 2017, some concerned onlookers saw the occasion as something less than celebratory. Following Hurricane Katrina, City Park, and this section of the park in particular, became part of a regional strategy to manage and retain stormwater. The museum will occupy an area otherwise devoted to ‘green infrastructure’ built around a system of waterways designed to absorb and mitigate flooding. 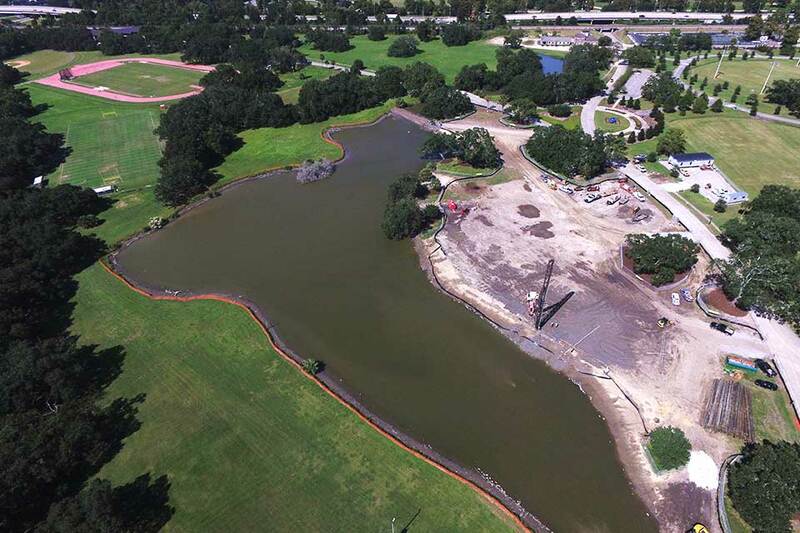 The 52,000-square-foot building and its parking areas will interrupt the lagoon system and will add more impervious surfaces to the park, reducing the space for water storage and minimizing water infiltration. This is not to mention that the building will also interrupt one of the most significant expanses of open land and sky within the park itself, part of the initial park plan to provide a rural retreat for a growing urban population. Finally, it was announced on September 27, 2017, that the board of the City Park Improvement Association amended the park’s master plan to designate some 90 acres, once part of the old East Golf Course, for passive recreation—a sign, perhaps, that public opinion is beginning to hold sway. The board left intact, however, the soccer fields currently on nearby Scout Island, officially designating them for active use. With its diverse tree canopies and forested areas, Scout Island represents the last truly natural landscape in City Park. With some foresight and minimal effort, the entirety of Scout Island could be made a publicly accessible natural area, which could easily be combined with the adjacent Couterie Forest to the north. The result would be a new whole that is greater than the sum of its parts—a freely accessible ‘in-nature’ experience in the heart of City Park. A series of pertinent amendments to the New Orleans master plan (“Plan for the 21st Century: New Orleans 2020”) is currently under consideration by the New Orleans City Council. If adopted, the amendments would provide policy solutions for maintaining equilibrium between green spaces and special-purpose uses within the city’s underfunded park system and would ensure that the public and their elected officials have a say in what happens to publicly owned land. Require that the conversion of public green space to intensive, commercial, or specialized uses is subject to scrutiny and review by the City Planning Commission and the City Council. The New Orleans City Council will vote on the amendments no later than mid-December. Contact the members of the New Orleans City Council and urge them to adopt the above-proposed amendments to the New Orleans master plan.